AMID all this talk of the value or otherwise of synthetic surfaces in Scotland’s top league, one aspect is often forgotten: there is nothing quite like a blood-and-guts battle in an unforgiving quagmire. Martin Canning, the Hamilton boss, had with some justification this week noted in defence of New Douglas Park’s artificial turf that it at least offered consistent and predictable underfoot conditions. But what might we lose in our game without days like these? It was breathless, thrilling stuff in the Dingwall mud. County grasped a lead on the cusp of half-time through Alex Schalk and then saw their best-laid plans torn to pieces by a foolish Jamie Reckord red card early in the second half. Amid the 10-man resistance, home keeper Scott Fox pulled off several outstanding saves – one jaw-dropping – before Dougie Imrie levelled. But as home manager Jim McIntyre observed, Ian McShane’s swerved free-kick winner was fit to grace the finest stages in football. “With the condition of the pitch and the weather today it was never going to be pretty,” McIntyre stressed. “We knew scoring the first goal was going to be vital. I felt Accies hadn’t threatened us in the first half. After that, the sending off changes everything. It’s a red card. 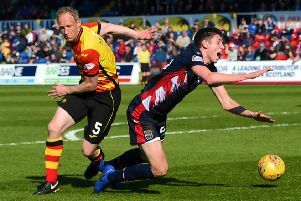 Defeat left Martin Canning’s Accies side just a point above the dreaded play-off spot, with the Accies manager incensed by the free-kick award against Ziggy Gordon’s challenge on Andrew Davies leading to the winner. Canning, though, could surely be consoled by his team’s fighting spirit against similarly minded opponents. County produced the best move of the first half after 28 minutes. A fine Jackson Irvine pass sent Schalk tearing at the Accies rearguard. It opened up in front of the Dutchman outside the area but he chose to knock a pass to Liam Boyce, who struck first time but saw the effort blocked by Michael McGovern. It was Accies who then enjoyed a purple patch of pressure, with Ali Crawford in the thick of the action, striking wide and just over the bar on separate occasions. Darren Lyon’s ambitious long-range dig also had to be tipped over the bar at full stretch by Fox. As the away pressure heightened, County defender Paul Quinn made a saving intervention to knock the ball for a corner as Carlton Morris cut a Gramoz Kurtaj pass across goal from the bye-line. After all the Accies’ pressure, County grabbed the lead right on the stroke of half-time. Antons Kurakins took a yellow card for cynically taking Richard Foster out on the break inside Accies’ half. Foster took the free-kick himself and the lofted ball was headed back across goal by the towering figure of Davies. Schalk, six yards out, reacted brilliantly to launch himself acrobatically into a header that held enough force to ensure McGovern’s glove only turned it into the roof of the net. The whole complexion of the game changed inside the first minute of the second period with Reckord’s last-man foul on Imrie earning the early bath. There followed an Accies siege with Imrie glancing home a header from a Kurtaj cross after 67 minutes to level. But County skipper Davies won the controversial free-kick outside the Accies penalty area to allow McShane to swerve a brilliant 22-yard finish past McGovern for the winner.